Versatility. Compact Design. The network-ready Lexmark MX310dn MFP with 2-sided printing includes 256MB standard printer memory and has print, copy and scan speeds as fast as 35 ppm. Function Colour Scanning Copying Faxing Network Scanning Printing Size (in. - H x W x D) 18.4 x 15.7 x 18.6 in. Packaged Size (in. - H x W x D) 22.48 x 19.09 x 21.65 in. Weight (lb.) 44.0 lbs. Size (mm - H x W x D) 468 x 399 x 472 mm Packaged Size (mm - H x W x D) 571 x 485 x 550 mm Weight (kg) 20.0 kg Product Guarantee 1-Year Onsite Service Packaged Weight (lb.) 49.5 lbs. Packaged Weight (kg) 22.5 kg UNSPSC Code 43212110 Product Certifications ENERGY STAR, ICES-003 Class B, BSMI Class B, VCCI Class B, US FDA, UL 60950-1, FCC Class B, cUL CAN/CSA-C22.2 60950-1, NOM, CB EN/IEC 60950-1, CB EN/IEC 60825-1, CE DoC (EN 62301 Class B, EN 62311, CE EN/IEC 60950-1, CE EN/IEC 60825-1, EN 61000-3, EN 55022 Class B, EuP, EN 55024, UL), EFTA (CE), KCC, CCC, CECP, CEL, C-tick DoC, UL-AR, KC mark, UL GS mark, EC 1275, MET-I, ISO 532B, ECMA-370, TED, GOST-R, SII, TER Specified Operating Environment Temperature:16 to 32°C (60 to 90°F) Humidity: 8 to 80% Relative Humidity Altitude: 0 - 2896 Meters (9,500 Feet) Country of Origin China (PR) Trademarks Lexmark and Lexmark with the diamond design are trademarks of Lexmark International, Inc., registered in the United States and/or other countries. All other trademarks are the property of their respective owners. ENERGY STAR® is a U.S. registered mark. Information in this document is subject to change without notice. AirPrint and the AirPrint logo are trademarks of Apple Inc. Unison is a trademark of Lexmark International, Inc. Display 6 cm (2.4 inch) colour LCD display ENERGY STAR Typical Electricity Consumption (TEC) 2.1 kilowatt-hours per week Touch Screen Display No Ethernet Network Yes Direct USB No Workgroup Size Small Workgroup Print Technology Laser, Monochrome Print Resolution, Black 1200 Image Quality 1200 x 1200 dpi 2400 Image Quality 600 x 600 dpi Print Speed (A4, mono): Up to 33 ppm Print Speed (A4, mono) Duplex: Up to 14 spm Time to First Page (Black) As fast as 6.5 seconds Processor Dual Core, 800 MHz Memory, standard 256 MB Memory, maximum 256 MB Printable Area 0.157 inches of the top, bottom, right and left edges (within) Printable Area (metric) 4.0 mm of the top, bottom, right and left edges (within) Noise Level, Idle Inaudible dBA Print Noise Level, Operating 53 dBA Duplex Print Noise Level, Operating 52 dBA Hard Disk Not Available Maximum Monthly Duty Cycle: Up to 50000 pages per month Recommended Monthly Page Volume 250 - 6000 Pages Duty Cycle Notes "Recommended Monthly Page Volume" is a range of pages that helps customers evaluate Lexmark’s product offerings based on the average number of pages customers plan to print on the device each month. Lexmark recommends that the number of pages per month be within the stated range for optimum device performance, based on factors including: supplies replacement intervals, paper loading intervals, speed, and typical customer usage. "Maximum Monthly Duty Cycle" is defined as the maximum number of pages a device could deliver in a month using a multishift operation. This metric provides a comparison of robustness in relation to other Lexmark printers and MFPs. ISO Speeds Print and copy speeds measured in accordance with ISO/IEC 24734 and ISO/IEC 24735 respectively (ESAT). For more information see: www.lexmark.com/ISOspeeds. 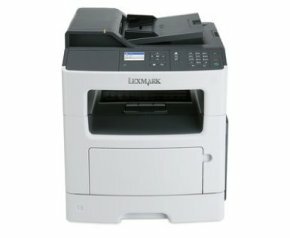 Copy Speed (A4, Black): Up to 33 cpm Copy Speed (A4 mono) Duplex: Up to 17 spm Time to First Copy (Black) As fast as 6.5 seconds Reduce / Enlarge Range 25 - 400 % Copier Noise Level, Operating 54 dBA Scan Area, Maximum 8.5 x 14 inches Scan Area, Maximum (mm) 215.9 x 355.6 mm Scan Technology CIS Simplex Scan Speed (A4 mono): Up to 42 / 43 sides per minute Simplex Scan Speed (A4 colour): Up to 19 / 20 sides per minute Optical Scanning Resolution 600 X 600 ppi (colour) 1200 X 600 ppi (black) Scanner Noise Level, Operating 55 dBA Scanner Type Flatbed scanner with ADF ADF Scan Simplex Modem Speed ITU T.30, V.34 Half-Duplex, 33.6 Kbps Fax Transmission Speed < 3 seconds per page ADF Paper Input Capacity: Up to 50 pages 75 gsm bond Paper Input Capacity, Standard: Up to 300 pages 75 gsm bond Paper Input Capacity, Maximum: Up to 850 pages 75 gsm bond Paper Output Capacity, Standard: Up to 150 pages 75 gsm bond Paper Output Capacity, Maximum: Up to 150 pages 75 gsm bond Finishing Option No Media Sizes Supported 10 Envelope 7 3/4 Envelope 9 Envelope A4 A5 DL Envelope Executive Folio JIS-B5 Legal Letter Statement Universal Oficio A6 Media Types Supported Card Stock Envelopes Paper Labels Plain Paper Transparencies Refer to the Card Stock & Label Guide ADF Paper Output Capacity: Up to 50 pages 75 gsm bond Paper Weight Range Supported - Standard Tray (gsm) 60 - 90 gsm Paper Weight Range Supported - Standard Tray (lb.) 16 - 24 lbs. Number of Paper Inputs, Standard 2 Number of Paper Inputs, Maximum 3 Duplex (2-sided) Printing Integrated Duplex ADF 50-Sheet Automatic Document Feeder Optional Paper Handling 250-Sheet Tray 550-Sheet Tray 550-Sheet Lockable Tray Included Paper Handling 250-Sheet Input 50-Sheet Multipurpose Feeder 150-Sheet Output Bin Integrated Duplex Cartridge(s) Shipping with Product 2,500*-page Return Program Toner Cartridge Photoconductor Notes Actual Yield may vary based on other factors such as device speed, paper size and feed orientation, toner coverage, tray source, percentage of black-only printing and average print job complexity. Imaging Unit Estimated Yield: Up to 60000 pages, based on 3 average letter/A4-size pages per print job and ~ 5% coverage Laser Cartridge Yields 2,500*-page Cartridge 10,000*-page High Yield Cartridge *Average standard page yield value declared in accordance with ISO/IEC 19752. Replacement Cartridges: Product functions only with replacement cartridges designed for use in a specific geographical region. See www.lexmark.com/regions for more details. Apple Macintosh Operating Systems Supported Apple Mac OS X (10.5, 10.6, 10.7, 10.8, 10.9) Microsoft Windows Operating Systems Supported Microsoft Windows XP Microsoft Windows Server 2003 Microsoft Windows XP x64 Microsoft Windows Server 2003 x64 Microsoft Windows Vista Microsoft Windows Vista x64 Microsoft Windows Server 2008 Microsoft Windows Server 2008 x64 Microsoft Windows 7 Microsoft Windows 7 x64 Microsoft Windows Server 2008 R2 Microsoft Windows 8 Microsoft Windows 8 x64 Microsoft Windows Server 2012 Microsoft Windows 8.1 Microsoft Windows 8.1 x64 Microsoft Windows Server 2012 R2 Microsoft Windows RT Microsoft Windows RT 8.1 Novell Operating Systems Supported Novell NetWare 6.5 Open Enterprise Server Novell NetWare 5.1(SP 6+), 6.0(SP 3+) with Novell Distributed Print Services (NDPS) Novell Open Enterprise Server on SUSE Linux Enterprise Server Linux Operating Systems Supported SUSE Linux Enterprise Server 10, 11 SUSE Linux Enterprise Desktop 10, 11 Red Flag Linux Desktop 6.0 Linpus Linux Desktop 9.6 Debian GNU/Linux 5.0, 6.0 Red Hat Enterprise Linux WS 4.0, 5.0, 6.0 Ubuntu 11.04, 11.10, 12.04, 12.10 openSUSE 11.3, 11.4, 12.1, 12.2 PCLinuxOS 2011 Mint 9, 10, 11, 12, 13 Fedora 14, 15, 16, 17 UNIX Operating Systems Supported Sun Solaris SPARC 9, 10 HP-UX 11.11, 11.23, 11.31 Sun Solaris x86 10, 11 IBM AIX 5.3, 6.1, 7.1 Citrix MetaFrame Microsoft Windows Server 2003 running Terminal Services with Citrix Presentation Server 3.0, 4.0, 4.5 Microsoft Windows Server 2003 x64 running Terminal Services with Citrix Presentation Server 4.0 x64, 4.5 x64 Microsoft Windows Server 2003 and 2003 X64 Edition with Citrix XenApp 5.0 Microsoft Windows Server 2008 and 2008 X64 Edition with Citrix XenApp 5.0 Microsoft Windows Server 2008 R2 with Citrix XenApp 6.0, 6.5 Standard Ports USB 2.0 Specification Hi-Speed Certified (Type B) Ethernet 10/100BaseTX (RJ-45), also works with 1000Base-T Optional Network Ports External MarkNet™ N7020e Gigabit Ethernet MarkNet N8352 802.11b/g/n Wireless Printer Languages (Standard) PCL 5e Emulation PCL 6 Emulation PPDS PostScript 3 Emulation Microsoft XPS (XML Paper Specification) AirPrint™ PDF 1.7 emulation Fonts and Symbol Sets 3 of 9 scalable PCL 5e fonts in Narrow, Regular and Wide 2 PCL bitmap fonts 39 scalable PPDS fonts 5 PPDS bitmap fonts 84 scalable PCL fonts OCR-A, OCR-B scalable PCL 5e fonts For more information, refer to the Technical Reference. 91 scalable PostScript fonts Network Protocol Support TCP/IP IPv4 AppleTalk™ TCP/IP IPv6 TCP UDP Network Printing Methods LPR/LPD Direct IP (Port 9100) Enhanced IP (Port 9400) FTP, TFTP Telnet IPP 1.0, 1.1, 2.0 (Internet Printing Protocol) Network Security SNMPv3 Network Management Protocols HTTP HTTPs (SSL*/TLS) SNMPv1, SNMPv2c SNMPv3 WINS IGMP APIPA (AutoIP) DHCP ICMP DNS Bonjour DDNS mDNS ARP NTP Telnet Finger *This product includes software developed by the OpenSSL Project for use in the OpenSSL Toolkit.